It’s not often an entomologist knowingly moves into a house that harbors brown recluse spiders, but we finally moved into our new home in April this year after a long remodeling project. In the first article of this series, I reviewed the various pest-conducive conditions associated with the house and the solutions I chose to remediate those issues. This article will delve into greater detail the efforts at excluding pests from a home that is located in the country and backs up to an agricultural field. FIRST, AN UPDATE. When the house was purchased, the crawlspace was damp with no vapor barrier and the vents were all blocked off. This lack of ventilation resulted in higher moisture content in the wood. After a year with vapor barrier and Temp-Vents installed, the moisture content is not where I’d like it to be so I am installing two powered Temp-Vents to further ventilate the substructure. Bora-Care with Mold-Care has been applied and the surface molds on the floor joists and other wood are dying and the wood is further protected from future mold and fungi. Routing the downspouts via drain pipes to the pond did not fully solve the water accumulation beside the foundation. The problem was the small, 4-inch gutters originally installed on the house were not suitable for containing the amount of rain coming off the roof during heavy rainfall (a regular occurrence in my area). Down came the 4-inch gutters to be replaced by large 6-inch gutters, thereby stopping the waterfall out of the gutters to the foundation area. PESTS INVADE. During the year we’ve owned the house, I have noted a number of pest incursions, the most notable was a large invasion of black ground beetles (Synuchus sp.) in the late spring. This invasion is related to bright white LED bulbs on the garage and the worn and damaged weatherstrips on the bottom of each garage door (more on this later). I caught one mouse in the garage in June, also due to the bad garage door weatherstripping. I had discovered a couple of bird carcasses in one of the attics, then this spring black birds set up a nest in the same attic. This indicated a large-sized gap somewhere at the roof line that was not visible from ground level. Closer examination using a 24-foot ladder revealed, like the rest of the house, this corner lacked gutter apron flashing to close off the gap between the fascia board and the roof subdeck (see Figure 1). (Left) Figure 1. Gap under edge of shingles. Note the old wasp nest. (Right) Figure 2. Xcluder fabric used to close off gap after installing gutter apron. A number of nests of two species of paper wasps (Polistes carolina and P. fuscatus) invaded the roof returns and the attic (via the lack of gutter apron). Mud dauber wasps also were invading the attic via the same routes — numerous old nests are present all over both attic spaces. Also, when we first bought the house, I would find paper wasps and mud daubers several times a week inside, likely entering from attic spaces through one of the many can lights in the house. The can lights on the back porch were filled with old (and some active) mud dauber and paper wasp nests. Last fall, Asian multi-colored lady bugs (Harmonia axyridis) made their presence known in large numbers off the back balcony, invading the bonus room space in that area in significant numbers. Strangely though, this was the only room with many lady beetles even though you can find dead lady bugs in the attic spaces. Other invaders were occasional in nature: a few wolf spiders, flies, and house and cellar spiders. EXCLUSION CONTINUES. Any house has multiple entry points for pests, with larger pests (rodents, birds) being easier to completely exclude, while smaller creatures (insects, spiders) are more difficult because finding and sealing off every tiny crack is nearly impossible. Even so, a great deal of insects and spiders can be excluded with reasonable exclusion efforts and investment. Garage — Replacing the weatherstrips along the bottom of all garage doors is not difficult but does take some time in labor. After removing the old weatherstrips, I installed the Xcluder Rodent Proof Garage Door Seal onto the bottom of each door. Prior to installing these, I would regularly find toads in the garage and also discovered and captured one mouse after placing a snap trap. Since, then no mice, no toads inside. Soffits & Gutters — I waited until I replaced the gutters to install gutter apron flashing to cover the gaps that exist between the fascia and the roof subdeck (Figure 1). This gap exists on all conventional pitched roofs and should be closed off to prevent rodents, birds, bats, bees, wasps and overwintering pests (cluster flies, lady bugs, stink bugs) from entering the attic spaces through this entry point. A gutter apron is a simple item to install as it slides under the shingles onto the roof subdeck on the roof side and down into the gutter, attached into place via nails or screws. Its primary purpose is to prevent rainwater from wrapping around the shingle edge back into the soffit, but just as critical, it serves as a shield against pests entering the soffit. It also helps keep moisture out of the soffits. 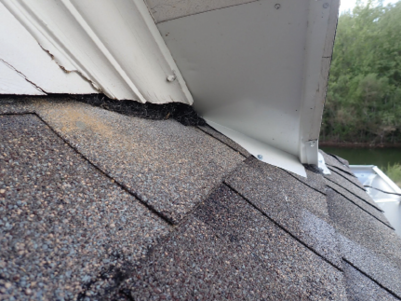 Once the gutter apron is in place, many people forget about the corners and edges of the soffits and leave gaps and cracks open where insects could still enter. At corners of roof valleys, you may need to install an additional flat flashing on top of the back edge of the gutter apron because the aprons do not completely close off the gap under the shingles at these corners. Figure 2 on shows how Xcluder Rodent Control Fill Fabric was used to close off gaps at the edges of the gutter apron. Xcluder Fill Fabric or silicone sealant also was used to close off other cracks found around the soffits and roof line. Roof Returns — A roof return is located wherever one roof ends along the roof of another portion of a house (see Figure 3). Builders usually leave gaps at the bottom of roof returns, some large enough to allow rats or squirrels easy entry into attics. Such gaps need to be closed off with metal flashing, molded to best fit over the gap. Still some small cracks or gaps remain, which may be covered with a small metal flashing or stuffed with Xcluder Fill Fabric. Prior to sealing off the roof returns on my house, I had to treat each one using residual dust to kill active paper wasp nests residing within many of the returns. Figure 3. Roof return after exclusion materials installed. Brick Siding Trim & Other Exterior Cracks — My house is brick veneer with wood trim and IFAS siding on upper sides of the house and clapboard siding on one porch. Cracks exist wherever wood or siding meets the brick. Some gaps are large enough on the porches to allow mice or a small rat to be able to squeeze into the attic or serve as points for paper wasps or yellowjackets to enter and build their nests. These cracks also were being used by lady bugs and other insects to enter into the attic and walls of the home. The wood-to-brick cracks were sealed off using clear silicone sealant for small cracks and Xcluder Fill Fabric for larger gaps. Xcluder Fill Fabric is available in 4-inch wide and 1-inch wide rolls, which were alternated depending on the size of the gap being filled. Eventually, the Xcluder in larger gaps occuring around the walls on the three porches will be covered using white mortar mix that matches the mortar lines in the brick siding. After treatment with residual dust, 1-inch Xcluder Fill Fabric also was used to fill in holes around hose bibs and AC lines and was placed into weep holes in the brick siding. Foundation & Attic Vents — My foundation vents were already equipped with decorative metal grates with insect screen behind this. The Temp-Vents added another layer of insect screening. Should I later find rodents entering the crawlspace, I will attach ¼-inch hardware cloth to cover the Temp-Vents inside. My house has three types of vents — soffit vents, gable vents and turbine vents, and I plan to eventually install ridge vents along the peaks of the roof. Ridge vents serve to better ventilate the attic, which helps with HVAC costs and also can extend the life of roof shingles. My gable vents and soffit vents are adequately covered with insect screening but the turbine vents have no screens. For these turbine vents, inside the attic, I attached a piece of ¼-inch hardware cloth over the opening and behind this, I added a piece of insect screen. The hardware cloth will exclude rodents while the screen excludes wasps and other insects. Should I discover rodents entering through the gable vents, I also may need to also add hardware cloth over these. Other Exterior Doors — My regular exterior doors are all fairly tight-fitting but I added Xcluder Residential Pest Control Door Sweeps to the bottom of each ground floor door. A second story balcony doorway, however, proved more problematic. After moving in, I discovered the doorway was leaking during heavy rain. When I examined it more closely, I found that the door threshold was not attached to the floor underneath as it should be because the door itself was ¾-inch too short for the framed opening. Also, the joists for the cantilevered wood balcony into the room’s floor space had gaps, also allowing water to enter. Despite the expense, a new, vinyl door was purchased and installed (of course it was a custom opening requiring a custom-sized door). After this, I had to pull up deck boards on the balcony, and use silicone sealant to seal off the gaps around all the deck joists where they enter the brick wall. I then fashioned a fitted metal flashing that covered horizontally from the threshold then vertically down onto the wall, around each joist. Silicone sealant was then used to close off all gaps and cracks along all edges of the flashing. 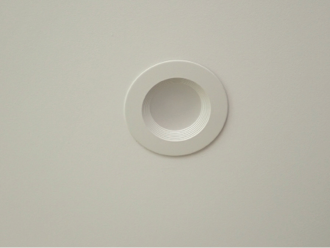 This solution resolved the leaking issue and closed off another avenue where insects could enter into the walls. Figure 4. LED can light retrofit. Can Lights — Can lights create a pest entry opportunity into the living spaces of a home from the attic and ceiling voids. Wasps, flies, lady bugs and similar insects that may enter an attic can be attracted to light emitting through the vent cracks on the can light housing. From there, the insects enter into the rooms below. In my case, I had paper wasps and mud daubers entering the home and when I removed the bulb and pulled off the decorative outer ring, I uncovered brown recluse spiderlings in many of the lights. Recluse spiders will use gaps around ceiling fixtures and can lights to enter rooms from ceiling and attic spaces. To fix this issue, I first applied residual dust into the space behind each can light, using the vent holes in the light housing. I replaced the bulbs with LED retrofits designed for can lights (see Figure 4). The LED retrofits close up tight to the ceiling and leave very little gap for insects or spiders to enter. The LED lamps also use far less energy and also give off no appreciable heat. They come in dimmable versions, which was needed in certain rooms. The LED retrofits also stopped wasps from building nests in the six can lights on the back porch. Plumbing Penetrations — Wherever plumbing pipes and drain lines entered the walls under sinks and behind toilets, the wall voids behind were treated using residual dust and then sealed with sealant and escutcheon plates fitted tightly to the wall around each pipe. This step should keep recluse spiders from exiting walls in these sites. Windows — Though not absolutely necessary, we decided to upgrade windows from wood to vinyl windows in much of the house. This installation closed off these sites from pests being able to enter around windows. Other Exclusion Issues — The dryer vent was missing a vent cover so a self-closing cover vent was installed over the vent pipe outside. While repairing a whirlpool bathtub, a large opening in the floor around drain lines was discovered which, based on the mouse droppings, allowed at least once mouse to enter. This opening was effectively closed off using Xcluder Fill Fabric. Back Porch — Mosquitoes were making it unpleasant to use the back porch. Searching online, I found www.mosquito curtains.com, which offers custom screened curtains that I installed across the opening to the porch. 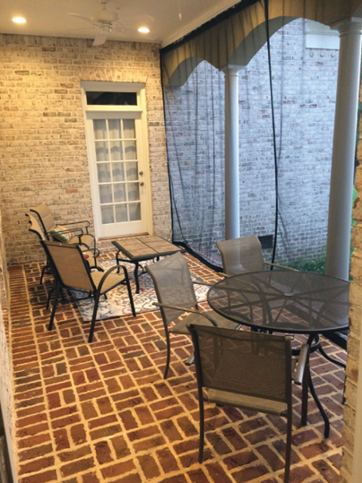 This was a much lower-cost alternative to converting the porch to a permanent screened-in porch (see Figure 5). The curtains were easy to install and also keep birds, mud daubers and paper wasps off the porch. Summary. It will be interesting to see how effectively all these exclusion efforts will be in limiting incursions of various pests into the home. Will I see many lady bugs inside this fall compared to last fall? Will I see any more mice? How many paper wasps will successfully be able to nest in or on the house next summer? Will I see fewer ground beetles and wolf spiders inside? Only time will tell. The author is with Stoy Pest Consulting, Memphis, Tenn.